Advocate for organ donation amongst their communities and get people to pledge their organs. The Government of India passed the Human Organ Transplant Act (HOTA) in 1994, which legalized cadaveric organ transplantation following brain death. Despite this, the rate of organ donation in India remains very low: less than 1 in a million Indians donate their organs after brain death. And since 2005, more than 3 million people have died in the country because of non-availability of organs. India severely lags behind other countries in organ donation rates – for example, in the United States, the rate is 25 per million. (Source: DNA, The Hindu.) To imagine how different things could be, consider the fact that India has the highest number of road accident deaths in the world: in 2009, 14 Indians died in road accidents every hour (source). If every one of these victims donated their organs, they would save thousands of lives. For more information on organ donation, please read this FAQ. Delhi: Organ Retrieval Banking Organization (AIIMS). Click HERE to download donor form. Karnataka: Zonal Coordination Committee of Karnataka for Transplantation. Click HERE to register online. Kerala: Kerala Network for Organ Sharing (KNOS)/Mrithasanjeevani. Click HERE to register online. Kolkata: Ganadarpan. Click HERE to download a donor card. Mumbai: Zonal Transplant Coordination Committee. Tamil Nadu: Cadaver Transplant Programme. Click HERE to download a donor card. Others: The MOHAN Foundation has a donor card which anyone can fill up and print out. Click HERE to register online. Another organisation is Donate Organs Save Lives. They too have online registration: click HERE. After registering, it is important that you inform your family of your wishes. In Indian law, in the event of your death, your family has final say whether your organs can be donated or not. I have pledged to donate my organs after death. 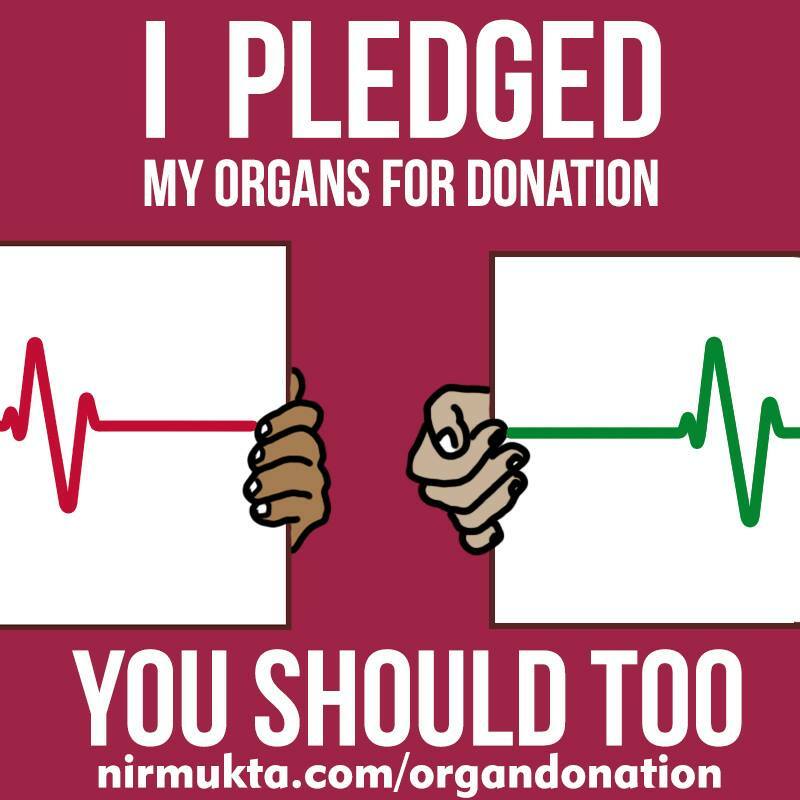 To know more about organ donation, why it’s important, and how to register yourself, please go to http://nirmukta.com/organdonation. Please also spread the word about the campaign by sending this link to your friends, family and colleagues.